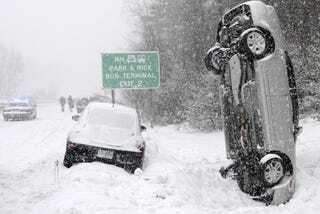 Having grown up in the Northeast, I became accustomed to snowy and icy roads from day 1 of driving. Literally, day one I had my permit, my dad took me to a parking lot full of snow and told me to punch it, then slam on the breaks to get a feel for how little traction a vehicle has in these conditions (my 1992 Taurus did not have ABS). After years of experience and a few close calls, I can say that I am confident (not overconfident though) driving in winter conditions. 1. Slow Down - I can't stress this enough. If you think you're going too fast, you are. No one is going to get pissed off in a snowstorm if you are going slow. Drive to your abilities and maintain a constant safe speed. 2. Back Off - Double the normal distance you would have between cars, if not more, and do not tailgate. Also, if you feel like someone is too close to your rear bumper, wait for a safe place to pull over, and let them by. No sense is getting nervous or worked up over it, you need to be focused on your car, not the guy behind you. 3. Be Patient - Don't expect to get anywhere fast and don't drive unless you have to. Getting worked up and stressed will only cause your judgement to be impaired. 5. Learn your vehicle - If you have an opportunity, find a safe, snow covered, empty parking lot and get to know your car. Know how long it takes you to stop from 30-0, how it steers, how it accelerates, etc. If you have a big enough lot, cut it sideways and get a feel for how your car reacts in a spin. This is your time to practice without consequence. 7. Be prepared with supplies - I have a duffel bag that I keep in my car with 1 gallon of water, a small shovel, gloves, a winter hat, a fleece jacket, a blanket, and a couple road flares. This stuff comes in handy. 8. Don't be distracted - Driving with a phone to your ear is dangerous enough. Turn off and put away anything that might distract you. You need 100% of your focus to be on driving.